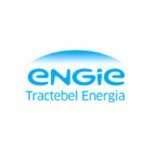 On-line monitoring of the bushing conditions has been adopted by Tractebel for all the step-up transformers 550 kV at hydroelectric power plants (UHE) of Machadinho, Itá and Salto Santiago, with the purpose of reducing the probability of failures, increasing the plant`s reliability, reducing maintenance costs and eliminating unnecessary interventions, which pose potential risk of inserting defects formerly absent, especially in case of chromatography gas tests. 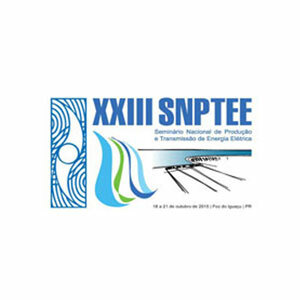 Three years after the operation startup, on-line monitoring indicated increase of capacitance and tangent-delta of a bushing at UHE Itá. With the transformer out of operation, off-line capacitance and tangent-delta measurements were made, as well as chromatography gas tests on the bushing oil. Although the latter tests have undoubtedly confirmed the insulation degradation and veracity of on-line alarms, the off-line capacitance and tangent-delta measurements presented results virtually unchanged, in an apparent conflict. This article will present the results of on-line measurements, and based on this data, the analyses performed to clarify the reasons for the low sensitivity to the detected defect in the off-line capacitance and tangent-delta measurements. Thus, it will be possible to delineate conclusions on the efficacy of off-line testing techniques, which for decades are considered as proven in the electrical power market worldwide, by comparing them with the results achieved with on-line monitoring. 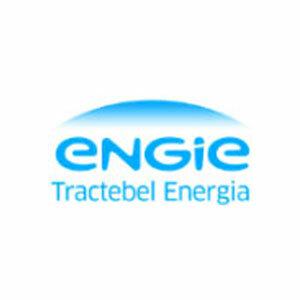 The on-line monitoring of bushing conditions in step-up transformers has been adopted by Tractebel as from 2008 for all the step-up transformers 550 kV at hydroelectric power plants of Machadinho, Itá and Salto Santiago, with the purpose of reducing the probability of failures in these machines due to problems in the condensive bushings, thus increasing the plant`s reliability, in addition to reducing maintenance costs by the elimination of periodical off-line tests on the bushings, which also provides the benefit of eliminating unnecessary interventions that pose potential risk of inserting defects formerly absent on the bushings, especially in case of collection of oil samples for chromatography gas tests. To do that, all the 550 kV bushings on step-up transformers, totaling 37 (thirty-seven) bushings for the three plants, were equipped with IEDs (Intelligent Electronic Device) for on-line monitoring of the capacitance and tangent-delta (or power factor) of the insulation. The operation principle of the sensors installed includes the measurement of capacitive leakage currents in the bushings and the vector sum of leakage currents, thus calculating the capacitance and tangent-delta variations of the bushings. In August 2014, that is, three (3) years after the operation startup, by considering that Itá plant was that last one in which the monitoring was installed, in 2011, the on-line monitoring has indicated increases of capacitance and tangent-delta in the bushing of phase B in the TR1 transformer at the UHE Itá, reaching alarm levels in terms of high tangent-delta and capacitance increase trend. Based on these indications, the transformer was removed from operation and replaced by the reserve phase, and measures were taken to carry out off-line tests on the bushing. These tests were effectively performed 3 days after the transformer shutdown and included off-line capacitance and tangent-delta measurements and gas chromatography measurements in the bushing oil. By using the gas chromatography test, it was undoubtedly checked the bushing insulation degradation, thus confirming the veracity of alarms generated by the on-line monitoring system. However, the off- line capacitance and tangent-delta measurements presented virtually normal results for both parameters, in an apparent conflict. This article will present the detailed results of the gas chromatography tests and the analysis performed, which enabled to conclude for the effective degradation of the bushing, as well as the off-line capacitance and tangent-delta measurements. Base on this data, it will be presented the analyses carried out to clarify the reasons for the lack of defect detection by the off-line capacitance and tangent-delta measurements. Also, based on the analyses performed, it will be possible to conclude on the efficacy of techniques used in the off-line capacitance and tangent-delta measurements, in spite of being used for decades as a proven technique in the electrical power industry worldwide, comparing it with the results achieved with on-line monitoring, which is carried out under real equipment operation conditions (operating voltage, temperatures, load current, etc.). The need for diagnosing the conditions of condensive bushings has been present since when the utilization of these accessories started, with the aim of preventing catastrophic failures that could pose personal risks, severe damages on the major equipment (transformers, reactors and other) and power outages. As the on-line monitoring was made available for the diagnostic of bushing conditions, the major techniques traditionally used in the industry to achieve these objectives in regard to operating bushings have been the off-line capacitance and tangent-delta measurements (power factor) of the main insulation of the bushing and the analyses of combustible gases dissolved in their insulating oil, as detailed below. According to IEC 60137-2008  standard, “Insulated bushings for alternating voltages above 1 000 V“, the measurements of the dissipation factor (power factor or tangent-delta) and dielectric capacitance must be taken at the factory, as routine tests, at ambient temperature between 10°C and 40°C, at voltage between 1 and 1.05 times Um (maximum operating voltage of the bushing), for bushings with Um greater or equal to 52 kV. Under these conditions, tangent-delta should not exceed 0.7%, both for OIP (oil-impregnated paper) and RIP (resin-impregnated paper) bushings. By their turn, no limiting values are defined for the capacitance measurement. IEC 60137-2008 standard does not define threshold values and testing conditions for field tests of operating bushings, although it has provisions for making the same capacitance and tangent-delta measurements at voltage between 2 kV and 20 kV for further comparison with the ones taken at field. ABNT NBR 5034-2014  standard presents great similarities with IEC 60137-2008, except for the threshold value of tangent-delta for RIP bushings, which is stipulated in 1.5% instead of 0.7%. This standard also establishes a threshold limit of 1% for the capacitance variance before and after the series of routine tests. However, it does not specify threshold values and testing conditions for field tests of operating bushings. By its turn, ANSI/IEEE C57.19.100-2012  standard, “IEEE Guide for Application of Power Apparatus Bushings”, suggests that such measurements are made upon the bushing installation, and repeated once elapsed one year of operation, and regularly at every 3 to 5 years afterwards. Tangent-delta measurements must be corrected at reference temperature of 20°C, in order to eliminate normal variance due to the bushing temperature upon the test. It is suggested to evaluate, in case the bushing presents tangent-delta increase between 1.5 and 2 times its initial value, the test frequency increase or bushing replacement, and also in case of 5% increase of the capacitance when compared to the initial value. IEC 60137-2008  and ABNT NBR 5034-2014  standards do not mention gas chromatography tests for bushings. By its turn, ANSI/IEEE C57.19.100-2012  states that such test is not recommended as routine test due to the risk of inserting defects on the bushing caused by moisture penetration when collecting the oil sample or sealing failure after this process, and recommends this test only as a way to confirming results in case of tangent-delta increase. By the other side, IEC 60599-2007  standard, “Mineral oil-impregnated electrical equipment in service – Guide to the interpretation of dissolved and free gases analysis“, indicates typical values for gas concentrations in the bushing oil, as shown in Table 1 for 95% of the bushing population used for the survey, as well a method for diagnosis based on the ratios between gases. 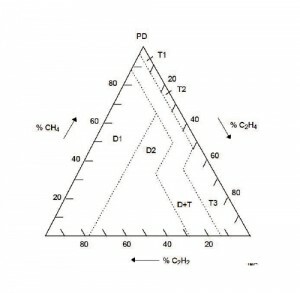 The Duval triangle, shown in figure 1, can also be used to establish the ratio among combustible gases CH4, C2H4 and C2H2 in order to obtain the diagnostic on the type of defect in the bushing. Capacitance and tangent-delta are recognized as the key parameters for non-invasive diagnostic of the bushing insulation conditions, as these parameters are directly affected by the insulation degradation. For example, insulation layers in short circuit cause increase of capacitance, while moisture penetration by lack of waterproofing causes increase of tangent-delta. A comparative study  correlating the values achieved in the off-line capacitance and tangent-delta measurements with the analyses of gases dissolved in the bushing oil with suspicion of evolving defects proves the efficacy of capacitance and tangent-delta measurements for the diagnosis of bushing defects. As this is a non-invasive method, on the contrary of the analysis of dissolved gases, and as it measures in a continuous way the insulation’s capacitance and tangent-delta, during the normal equipment operation, online monitoring is the answer for the requirement of on-line diagnostic of the bushing conditions, detecting the defects in an early stage. 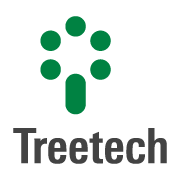 The principle of operation of the on-line monitoring system used at Tractebel is described below . To perform the measurement of leakage currents from test tap or voltage test in a safe and effective way, adapters are required to be used as electrical and mechanical interface between the tap and the electric circuits that will carry the current to the measurement site. Figure 2 shows an example of installation of these adapters on the tap of 550 kV and 230 kV bushings. By conducting a simplified analysis, we could consider that the tap adapter is only a socket to enable electrical contact between the bushing tap and the measurement entrance of the bushing monitor. This simplification is evidenced both as wrong and hazardous, as we must consider that the bushing tap should never remain open. Among the electrical characteristics to be provided by the adapter, in order to meet the safety and performance requirements of the monitoring, we highlight its differentiated mechanical design and the protection against failure in the electrical connection of the measurement circuit or in case of accidental disconnection. The tap adapter used has inside it a protective circuit with double function. The first one is a redundant protection against tap opening in case of accidental disconnection of the connection cables between the adapter and the measurement module of the bushing monitor. This protection has instant effect, by being activated and limiting the voltage in any part of the tap adapter at ≈15 Vac. The protections used are capable of conducting during undetermined time and are sized for impulse test (BIL) 2,050 kV – bushing 765 kV. In addition, each adapter has double protection, which provides redundant protection by actuating in parallel. These characteristics are ensured by a mechanical design that makes the protections inaccessible during handling and installation of the adapter. The second function is the primary protection against related overcurrents (several kA’s) and overvoltages that occur on the bushing tap in case of overvoltages caused by switching or atmospheric impulses. Figure 2 – Example of tap adapter installation. Source: . The measurement of electrical magnitudes in the order of mA and µA in environments electromagnetically aggressive, such as at a high-voltage substation, has been a constant challenge in the preparation of precise and reliable systems for monitoring of electrical equipment. In the specific case of bushing monitoring, a number of techniques are used to face such challenge. The bushing monitor applied at the power plants (UHE) of Tractebel use the technique of vector sum of leakage currents of bushings in a 3-phase assembly. This technique offers some advantages, such as on-line monitoring of changes, both in terms of capacitance and tangent-delta, in addition of not requiring measurement of phase-ground voltages applied on the bushings. Some techniques are not capable of monitoring tangent-delta. Others require the measurement of phase-ground voltages applied on the bushings, and frequently, there is no potential transformer available at the premises to provide such information. In each one of the bushings, the leakage current flows through the capacitance C1 to ground, passing through the capacitive tap, and this current is a function of the phase-ground voltage and insulation impedance. Any change in this current would reflect in a change of the bushing impedance. 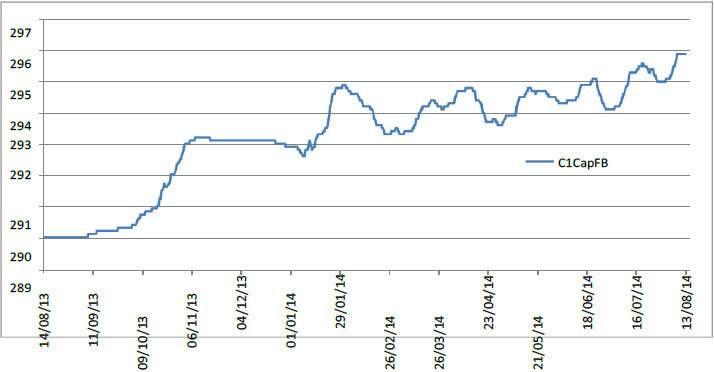 In principle, this current could be used to measure such change. Notwithstanding, the prevalent capacitive characteristic of the leakage current and the magnitude order of the changes to be measured have the challenge of measuring changes at a magnitude order of 0.7% in the dissipation factor, which could be the difference between a new and a risky bushing, and this change virtually does not change the total leakage current that flows from a bushing. The vector sum technique of leakage currents, used to overcome this difficulty, leverages the fact that the three leakage currents are out-of-phase each other in approximately 120º, and usually have the same magnitude order. Thus, the vector summation tends to exhibit a value very lower than each one of the individual leakage currents, as illustrated in Figure 3(a), for a given initial condition of capacitances and tangent-delta’s. Figure 3 – Leakage currents of three bushings in a 3-phase system and their summation; (a) For a given initial conditions; (b) With change in the capacitance and dissipation factor of phase-A bushing. 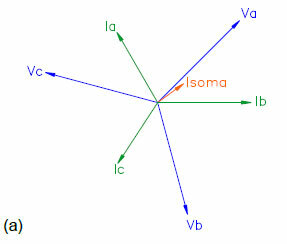 By assuming now a change in the capacitance and dissipation factor of the phase-A bushing A, as shown in Figure 3(b), the change vector that expresses the offset of current Ia from its initial value to its final value also reflects on the summation current, which is changed in relation to its initial value according to the same change vector. This change vector virtually has an insignificant weight when compared to the magnitude of the leakage current of phase A. However, the same does not occur when this vector is compared to the summation current, which enables its detection, and thus the detection of the change occurred in the impedance of the bushing in question. 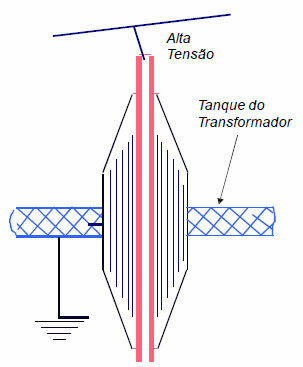 Therefore, the technique of vector sum of leakage currents provides an increase of sensitivity that makes unfeasible monitoring the changes occurred in both the insulation’s capacitance and tangent-delta. 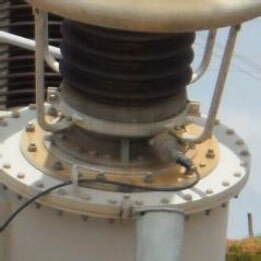 Approximately three years after installing the on-line monitoring of bushings on the step-up transformers at UHE Itá, the bushing monitor generated alarms for the phase-B bushing in the transformer TR1. A warning of capacitance increase trend was initially exhibited, although the capacitance value had not reached the thresholds set for high and very high capacitance alarms. A few time later, on 08/08/2012, the capacitance reached an alarm threshold of high capacitance, thus confirming the trend previously indicated by the bushing monitor. 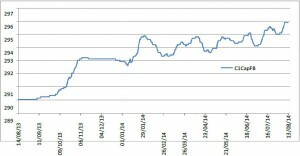 The chart in figure 4 shows the capacitance evolution within the one-year period, from its initial value of 290 pF until reaching on 08/08/2014 the alarm threshold value for high capacitance, set at 295.8 pF, that is, 2% increase on the initial value. In parallel to the capacitance shown, there was also an increase in the on-line value calculated for tangent-delta, from the initial value of 0.39% to a final value close to 1.2%, that is, three times its initial value. It is interesting to observe that the stability of the on-line monitoring system enabled to set the alarm threshold with a relatively low value, only 2% when compared to the suggested value of 5% provisioned in ANSI/IEEE C57.19.100-2012  standard, in order to provide great sensitivity to detecting defects in the on-line monitoring system, without generating undue alarms. In function of the alarm generated by on-line monitoring, the maintenance engineering staff at Tractebel scheduled a shutdown of the equipment, which has been replaced by the Reserve phase of the bank, in order to enable the conduction of off-line tests that could evidence the bushing conditions. These off-line tests were effectively performed 3 days after the transformer shutdown and included off-line measurements of capacitance and tangent-delta and gas chromatography in the bushing oil, obtaining the results shown in tables 2 and 3 below. As we can see in table 2, the capacitance and tangent-delta values achieved in the off-line test, when analyzed individually, would indicate that the bushing is in good conditions, as they do not present any correlation with the on-line monitoring indications. However, the analysis of dissolved gases in the suspected bushing oil, according to the data shown in table 3, and the analysis below, indicates a very different conclusion. In this same table we also inserted the results from the analysis conducted on the phase-C bushing of the same transformer, for reference purposes only. The analysis of these gas measurements in the oil, in accordance with IEC 60599-2007  standard, reveals that combustible gases Hydrogen (H2), Methane (CH4), Ethylene (C2H4), Ethane (C2H6) and Acetylene (C2H2) present values very above the ones considered as typical (acc. to table 1). 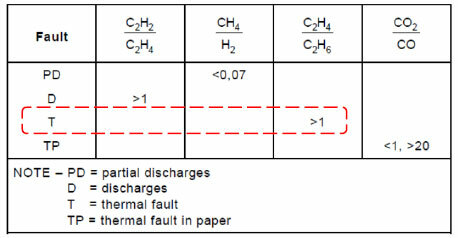 According to this standard, the diagnosis of the type of defect on bushings can be made by performing simplified calculations of the ratios between gases, shown in figure 5, which due to the C2H4 / C2H6 ratio equal to 3.3 (thus greater than one), lead to “T – Thermal Fault” diagnostic. 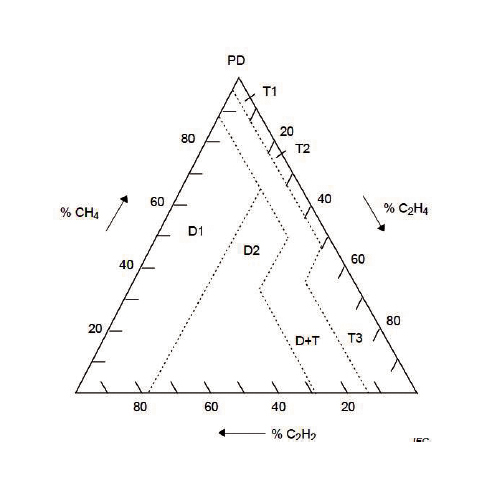 By applying the Duval method, the percentage ratios of gases CH4, C2H4 and C2H2 in relation to the sum of these same three gases lead to the diagnostic “T2 – Thermal fault between 300°C and 700°C”, as indicated by the red dot on the triangle of Figure 6, which is compatible with that in IEC 60599-2007 standard. 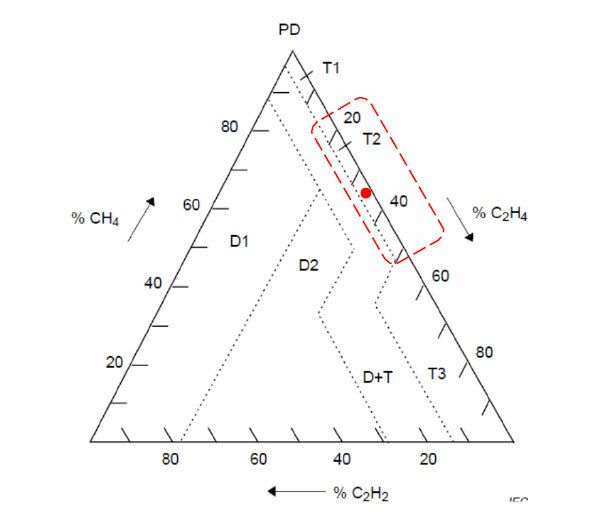 Figure 6 – Diagnostic by the Duval triangle: T2 – Thermal fault between 300°C and 700°C. Source: . Thus, the diagnostic based on gases dissolved in the oil corroborates the diagnosis of bushing defect. indicated by the on-line monitoring, thus proving that the decision of removing the transformer from operation was right and that the monitoring system operated correctly, thus preventing probable explosion of the bushing and severe damages on the transformer. As presented above, although the diagnostics provided by the on-line capacitance and tangent-delta monitoring, and by the analysis of dissolved gases, has exhibited coherence each other and confirmed the existence of a bushing defect, the diagnostic achieved by the off-line measurement of the same variables measured by on-line monitoring (capacitance and tangent-delta) was different, as it did not detect significant variances in relation to the initial reference values. Thus, off-line capacitance and tangent-delta measurements exhibited low efficacy for the correct diagnostic of the bushing conditions. In the analysis performed with the data available to the time, the reasons listed below were pointed out as the most probable ones for this fact. The tests for off-line capacitance and tangent-delta measurement of the bushings were carried out 3 days after the transformer shutdown, which was replaced by the Reserve phase of the bank. Thus, the dielectric temperature had enough time to be equalized with ambient temperature, which was 16 °C upon the test. As widely known, the tangent-delta value of the oil-impregnated paper (OIP) type insulation, which is the case of the bushing in question, has strong dependence with the dielectric temperature, even on insulations in good conditions. This is a characteristic that tends to worsen when the insulation presents increase of tangent-delta value. Therefore, the fact of the off-line test be carried out at temperature very below the real operating temperature of the bushing may impair the detection of changes in the tangent-delta value, and thus reduce significantly its efficacy for the diagnostic of the equipment conditions. Indeed, reference  provides data of measurements related to a bushing removed from service due to high tangent-delta alarm, performed as the bushing cooled down after shutdown, which clearly evidence the effect of temperature reduction, causing significant reduction of the tangent-delta value, and that can lead to erroneous diagnostic on the bushing conditions. By the other side, the on-line tangent-delta monitoring is made with the bushing in its real operation conditions, which is very higher than the ambient one due to the immersion of its bottom part in the top of the transformer’s oil – which in the case being studied, operates with constant load, close to the nominal one (“flat” load), as this is a step-up transformer of power plant, resulting in temperatures constantly high on the oil top level -, in addition to the temperature increases caused by Joule effect on the center conductor of the bushing and the existing dielectric losses when the bushing is powered at its nominal voltage. Therefore, as the on-line tangent-delta measurement is made in the real bushing operation conditions, in the practice, it was confirmed as more effective than the off-line measurements for the diagnostic of equipment conditions. Another great difference between the capacitance and tangent-delta measurements made off-line in relation to on-line monitoring is the voltage applied on the bushing’s dielectric. While in the on-line monitoring during the normal operation of the bushing, this is powered at the nominal voltage, 550 kV / √3 ≈ 318 kV in the case being studied, for off-line tests, the voltage usually applied has an order of 10 kV, i.e. 3% of the nominal one. The constructive form of condensive bushings, shown in figure 7, originates a large quantity of capacitors in series, in order to create a capacitive voltage divider. A bushing at nominal voltage of 550 kV will be comprised by tens of capacitive layers, depending on the manufacturer. When considering an average number of 70 layers, this bushing powered at nominal voltage of 550 kV / √3 will have each insulating layer submitted to an approximate voltage of 4.5 kV. When powered at 10 kV for the off-line test, this same bushing will have each layer submitted to 140 V only. Due to the fact that such constructive form originates several capacitors connected in series, the capacitance increase in this type of bushing is caused by one or more insulation layers in short circuit. By the other side, the experience with the dissection of bushings in this condition   shows that the short circuit of an insulating layer does not usually consists of a “true short”, but a path of relatively low impedance due to carburizing of the insulating paper, usually present on the edges of holes on the paper. Thus, it is reasonable to suppose that, in a condition of low voltage applied to the damaged insulating layer, this voltage is not sufficient to break any fine insulating barrier occasionally interposed in this carburized path, which could be presumably caused, for example, by any small displacement of the paper that creates space for the penetration of insulating oil from neighbor regions, and that also has reasonable dielectric strength. By the other side, the on-line capacitance monitoring is made with the bushing in its real operating conditions, powered at the nominal voltage, which results in a large difference of potential applied on each insulating layer. Very probably due to this reason, the on-line measurement of capacitance was evidenced in the practice as more effective than the off-line measurement for the correct diagnostic of the equipment in the case being analyzed. 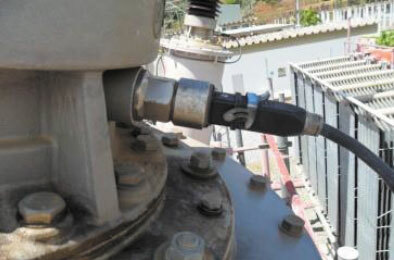 The experience at field presented herein of detecting a defect on a 550 kV bushing in a step-up transformer at UHE Itá enabled to prove the efficacy of on-line monitoring of bushings installed in this and other power plants near 3 years before, thus meeting the objectives for reducing the risk of catastrophic failures, eliminating the very high cost of these failures and increasing the installation reliability, in addition to the increase of maintenance efficiency and reduction of maintenance costs by preventing unnecessary interventions for off-line tests. By the other side, this experience also enabled to checking the efficacy of test techniques being widely used for decades in the industry for the diagnostic of the conditions of operating bushings, confirming the low sensitivity of off-line capacitance and tangent-delta measurements for the defect detected in the bushing being studied. Although this analysis has confirmed the great sensitivity of the analysis of dissolved gases in the oil for detecting defects in bushings, the risks of defect insertions in the bushing make the utilization of this test applicable to special situations only, such as the final confirmation of a defect diagnosis. The evidences presented above, associated to the need for continuous and on-line diagnostic during the whole equipment operation time, without any “blind zones” during the intervals between tests, in addition to the difficulties to power the equipment off, confirm that the on-line capacitance and tangent-delta monitoring of the bushings fully meets the needs of the power utility company. International Electrotechnical Comission, IEC 60137 Edition 6.0, “Insulated bushings for alternating voltages above 1 000 V”, 07/2008. 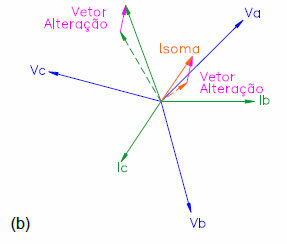 Associação Brasileira de Normas Técnicas (ABNT), ABNT NBR 5034-2014, ” Buchas para tensões alternadas superiores a 1 kV”, Outubro/2014. Application of Power Apparatus Bushings”, Fevereiro/2013. International Electrotechnical Comission, IEC 60599 Edition 2.1, “Mineral oil-impregnated electrical equipment in service – Guide to the interpretation of dissolved and free gases analysis”, 05/2007. Doble M-4000”, IV Conferência da Doble Brasil – Cemig. Belo Horizonte, Brasil, 2003. 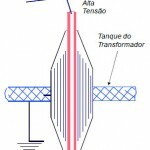 Araújo, D. C. P., Alves, M. E. G., Teixeira, R. M., Silva, J. C., Moreira, C. R. N., “Prevenção de Falha em Transformador Trifásico 525 kV pela Monitoração On-Line de Tangente Delta de Buchas”, XXII SNPTEE – Seminário Nacional de Produção e Transmissão de Energia Elétrica. Brasília, Brasil, 2013. Alves, Marcos, Pena, Miguel C Medina, Severino, Cláudio “DEFEITOS DE EVOLUÇÃO RÁPIDA E MUITO RÁPIDA EM BUCHAS DETECTADOS POR MONITORAMENTO ON-LINE”, XXI SNPTEE – Seminário Nacional de Produção e Transmissão de Energia Elétrica. Florianópolis, Brasil, 20011.